As you might’ve probably figured already, Bose (“Bose Corporation“) is one of the largest brands in the headphone industry, and they’ve got plenty to show off. These guys manufacture premium-quality noise-canceling headphones, circumaural headphones, and all kinds of mobile headsets. Their products mostly excel in spheres of design, sound, and convenience. Before we begin our review of Bose’s QuietComfort 35 II, we’d like to mention the “Quiet Comfort” series standalone. 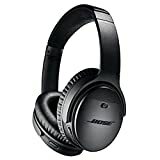 Namely, this was one of the most successful Bose headphone series, as it represents the superiority of Bose in the active noise-canceling technology sphere. That’s just one of the reasons why we’ve handpicked Bose’s QuietComfort 35 II and decided to check it out – the majority of other reasons are concerning its predecessor, the “prima” Quiet Comfort 35. Anyhow, if you’re into gadgets and tech stuff, you’re in for a real treat, as QuietComfort 35 II brings plenty of innovations onboard. Basically, Bose Quiet Comfort 35 II is a plain, straightforward set of Noise-canceling Over-ear headphones, but there’s a lot more to it than the eyes can see, so we intend to leave no stone unturned during the process. First and foremost, we’ll begin with the design, as it’s only common. These headphones are not only beautiful but highly durable as well due to the remarkable features outfit. On top of that, we’ll thoroughly discuss the specifications and equipment that manufacturer supplied with these headphones. 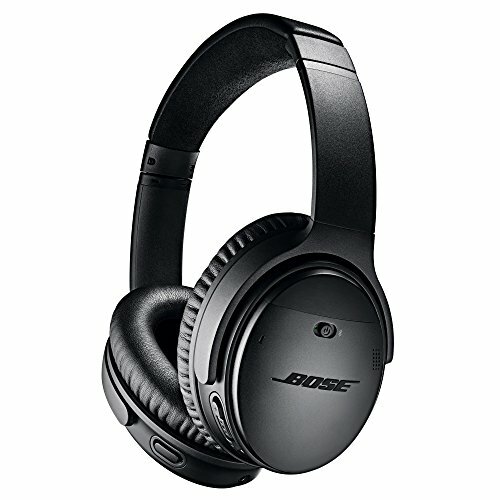 The design of Bose Quiet Comfort 35 II is nearly identical to the previous (original) QuietComfort headphone set. It comes outfitted with similar construction materials, including molded plastics, foam cushions, and such. First of all, it’s obvious that Bose didn’t want to bother too much about how their headphones will look – this model is wireless, Bluetooth-activated, durable, comfortable, and highly valuable for the buck. There’s no reason to overdo it with pointy, odd edges, and, as a matter of fact, the overall feel of simplicity above QC35 II is what makes them truly beautiful. Color: You’re free to choose between the “Black” and “Silver” color variations, both looking absolutely ravishing and amazing. There are no potential flaws or hidden drawbacks concerning the design – what you see is what you’ll get. The only reason why QC35 didn’t “deserve” the full five out of five is that there are no significant or substantial changes concerning the design. Even though it’s beautiful, some folks might dislike the fact that their newer model will look nearly exactly the same as their older one. Be it as it may, most people liked the previous one, so going below the “straight four” wouldn’t be fair. Bose earned its fame for their active noise-canceling technology, and they’ve put everything on the line with QC35 II. The already superb technology has peaked with these headphones, bringing the absolute, perfect, and personal music listening experience. The logic behind the noise and sound cancellation are quite simple – the hardware embedded within the construction of QC35 “spots” the outside noise, after which an opposing signal is transmitted, negating it all together. This technology is a must for people who clearly have a low bar of tolerance for whooshing winds, indistinctive chatter, and such. Most people compare the infamous “google assistant” to “Siri“. This little feature serves as a helper, and as a guide which will lead you through the basic fundamentals of QC35, explaining the features you might have some trouble figuring out, and providing help when needed. To use it, simply hold “Action“, and the conversation will already have started. Usually, high-end headphones come outfitted with good EQ service, but, this time, it wouldn’t be fair to compare. The Bose’ volume-optimized equalizer is capable of regulating the flow of frequencies at any given volume alone, whereas most headphones require specific drivers, buffers, or filters. Simply put, the entire soundstage is balanced, leaving nothing short of perfect, full-spectrum sound within your ears. Clear calls – Snuffs outside and ambient noise faster and more efficiently Combined with the impeccable noise-cancellation technology, the balanced equalizer easily takes care of muffled calls and similar problems. You can rest assured that your conversations will be free of any interference whatsoever. The “Lithium-Ion” batteries aren’t so rare, but we can only assume that Bose engineers tweaked and tinkered with the best models, resulting in an improved lifespan and reliability. There’s hardly a need to further explain why Bose QC35 II deserved the best possible rating concerning the features. The previous version of this remarkable model was already fascinating as it is, and the improved one is better and stronger in all aspects. Bose QC35 II is remarkably comfortable to wear, just like its predecessor. Actually, there are no differences in the comfort levels when we compare the QC35 and QC35II, as the design is virtually the same. The large, over-ear cupped design neatly falls over the user’s ears, creating a cushioned feel. The earpads are adorned with premium-quality foam materials which are superbly comfortable on their own. What’s more, the wireless convenience further boosts the comfort rating. If you’re a kind of person who values comfort, you might want to consider these aspects, and evaluate them yourself. Some headphone sets are specifically designed to provide comfort over quality, hence they feel a bit better than QC35 II. However, keep in mind that Bose’ Quiet Comfort 35 II features a well-balanced design and construction. Again, we’ll assume that the engineers didn’t want to overaccentuate any field of performance while cutting back on another, so it’s only normal that the comfort level of QC35 II isn’t perfect, per se. First of all, there are no issues concerning the comfortability of these headphones. They’re superbly comfortable, but this quality isn’t “perfect”. You will benefit from increased convenience due to a wireless method of operation, and the padded ear cushions will provide a smooth feel. Alas, that’s all there is to it, hence the four out of five. In essence, the performance of Bose Quiet Comfort 35 II is overwhelming, to say the least. All the features combined, even though they’re balanced and purposefully engineered to accommodate a plethora of different needs, yield a powerful sound emission that takes a form of supreme performance in all aspects. Simply put, all the possible barricades that would hinder your music experience are out of the way, the balanced soundstage is complimented by absolute sound customization potential, allowing you to enjoy your music at a whole new level. This remarkable set of headphones is outfitted with state-of-the-art technologies and features which are to “blame” for the exquisite level of performance QC35 II boasts. the sound qualities this headphone set boasts gently creeps into and under the skin of the listener, lingering for days, even after the switch is popped. The superb noise canceling technology negates the ambient noise, somewhat dulling your other senses, leaving you “exposed”. In conclusion, it’s safe to assume that your experience with QC35 II will be a unique one, as well as the most pleasant one. Bose’ QC35 II is the last letter of technology in the headphone world. You’ll have a tough time finding a model that will be able to accommodate your needs for music in such a way that QC35 II can. This segment of performance has no potential drawbacks or flaws whatsoever, and we implore you to expect a lot – Bose will deliver. Now, the price tag that sits atop Bose QC35 II models might come as a surprise – this headphone set is not nearly as expensive as most people would assume. Even though we couldn’t say it’s cheap, per se, Bose Quiet Comfort 35 II is definitely a bargain by high-end standards. These headphones belong to the “boutique” price point category, and if we’re to leave out everything we’ve said so fair, the price would appear to be quite high. Nevertheless, the quality QC35 II brings, the benefits that revolve about, as well as the sky-high value it boasts prompt us to answer the question – is Bose QC35 II worth the cash? You are the judge, as you’re about to decide whether or not you like them. Objectively speaking, everything about Bose QC35 II is “nearly perfect“, and the price is definitely not an exception. Even though these headphones don’t come cheap, they’re more than valuable for the cash. There’s an abundance of benefits aboard, and rating it with anything short of five out of five would not be right. 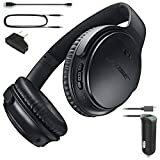 Essentially, Bose Quiet Comfort 35 II is more than capable of succeeding the title of the “best active noise-canceling headphones” from its predecessor – the original QC35. The features are absolutely amazing, the comfort rating is nearly perfect, and its performance will blow your mind, and that’s an understatement. All things considered, the QC35 II earned its salt, and you should definitely try it out, if you haven’t already. Overall, Bose Quiet Comfort 35 II excels in terms of features, performance, and price. The overall comfortability and design aren't as perfect, but they boast high values as well.